Cupcakes have taken over Disney Parks, and we’ve tried just about every single one of them!!! 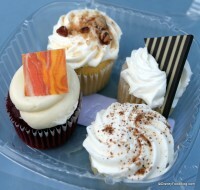 Check out our finds below…and plan your cupcake map around the World! 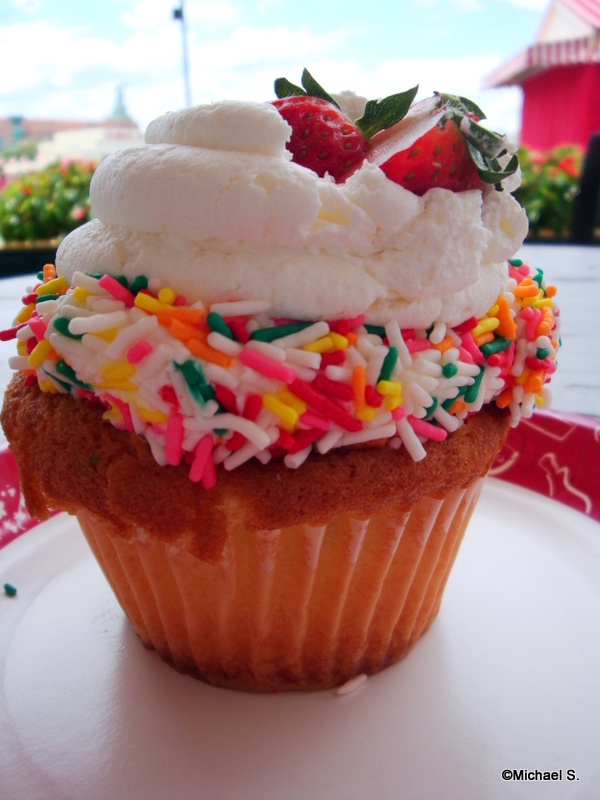 Don’t forget that many cupcakes in Disney World can be purchased for a Disney Dining Plan snack credit. Don’t forget to try the Disney Food Blog Cupcake Crawl, featuring some of our favorites from below and other new cupcakes we’ve found! Want some more great snacks?? Check out our DFB Guide to Epcot Snacks and our DFB Guide to Magic Kingdom Snacks e-Books! 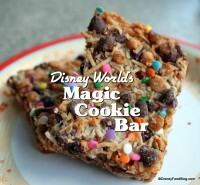 They feature hundreds of our favorite snacks in Disney World! 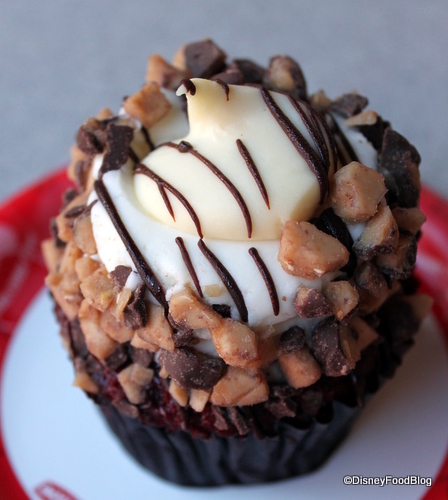 Red Velvet Cheesecake Cupcake: This is quickly becoming a fan favorite after being introduced in late 2010. The red velvet cake topped with cream cheese frosting and the slightest dollop of what seems like real cheesecake is decadent to say the least! Get it at Disney’s Hollywood Studios! Check out the Wreck-It Ralph version! 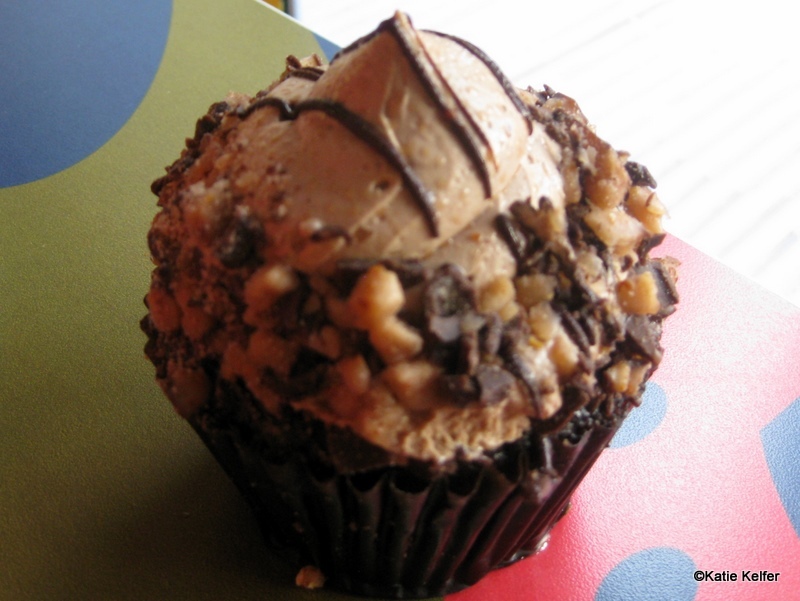 Chocolate Peanut-Butter Cupcake: This is the one for you chocoholics! 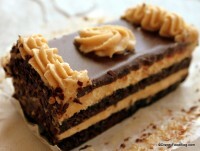 A rich chocolate cake injected with chocolate and peanut butter frosting, and piled high with chocolate peanut butter frosting and chocolate shavings. 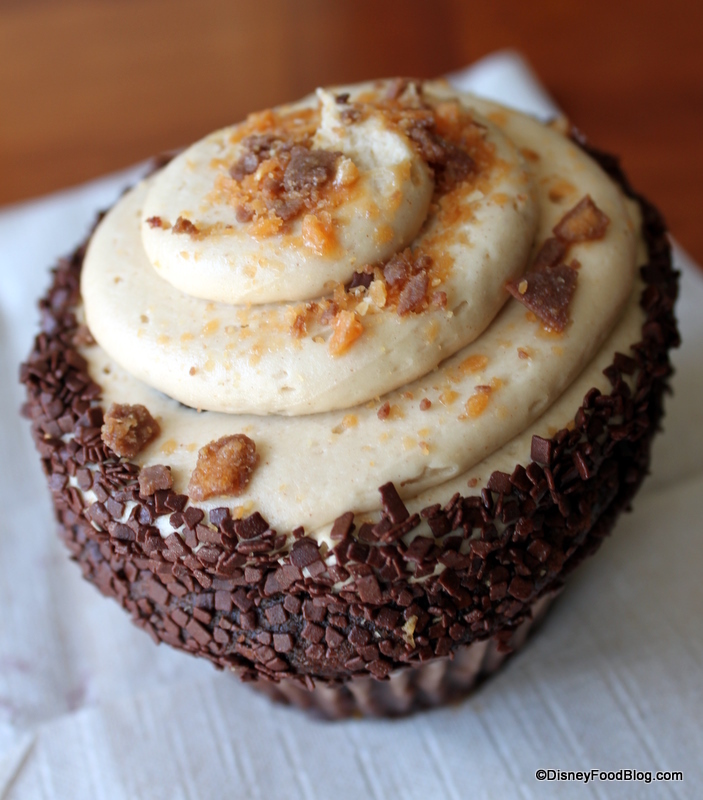 Butterfinger Cupcake: Our original “You Won’t Believe This!” Snack, the Butterfinger cupcake has delighted all who’ve sampled it (even those who couldn’t possibly finish the whole thing!). 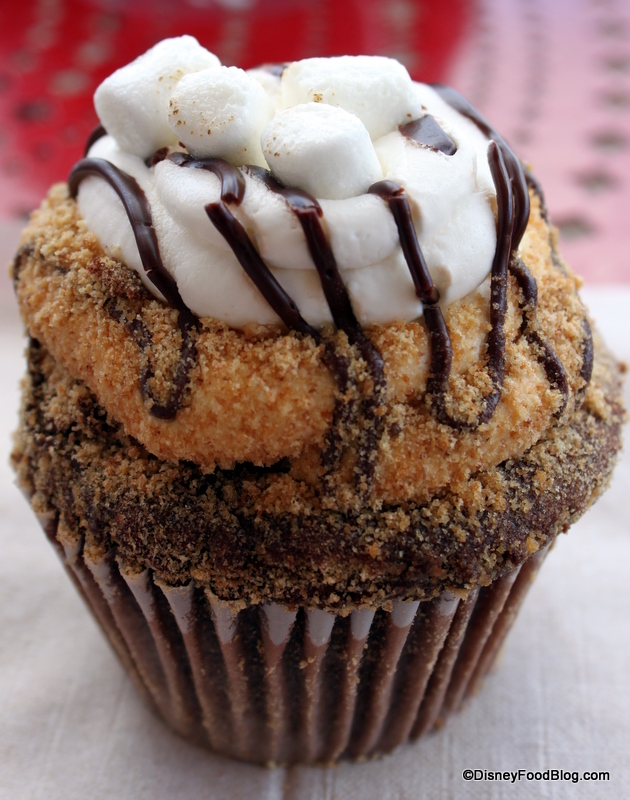 Chocolate cake, vanilla frosting, chocolate coating, and real Butterfinger crumbles make this an astonishing feat of deliciousness. 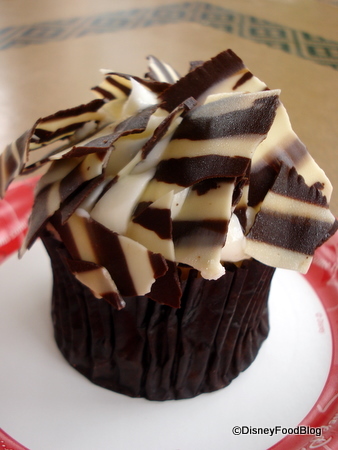 Marble Cupcake: A marble-y vanilla and chocolate cake surrounds chocolate filling and is topped with piles of vanilla frosting and real chocolate sprinkles. 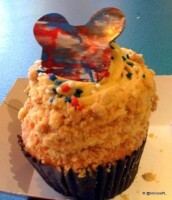 The whole thing sports a crown of chocolate and Mickey Mouse sprinkles. Carrot Cake Cupcake: Another treat for carrot cake fans. 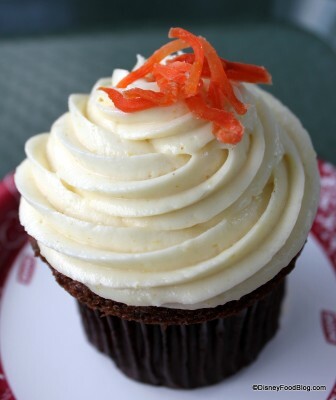 This one is moist carrot cake with sweet and creamy frosting served in cupcake form! 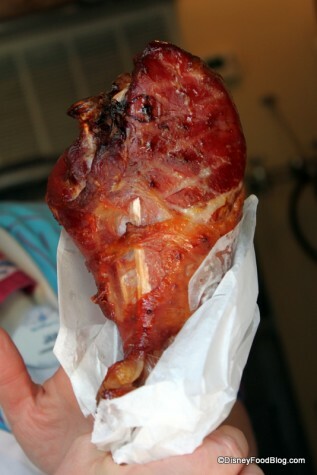 Now available at Roaring Fork at the Wilderness Lodge. 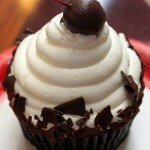 Black Forest Cupcake: This huge chocolate cupcake piled high with vanilla buttercream frosting is large enough to share! 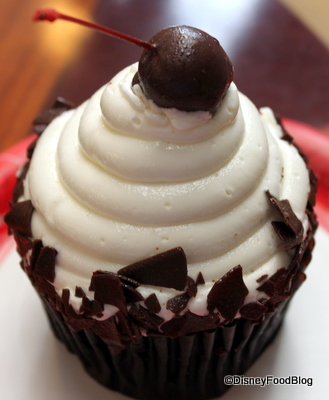 While crowned with a chocolate covered cherry, the glory for foodies is hidden in the cake’s middle where you’ll find cherry pie filling. Coffee Mocha Cupcake: Another amazing Boardwalk Bakery treat, the cake is chocolate with coffee flavor. 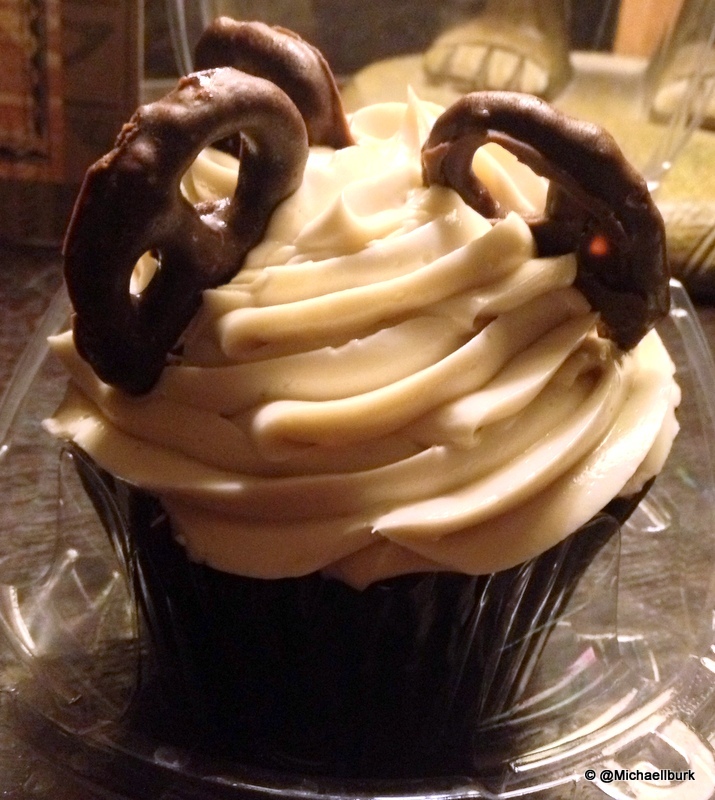 You’ll love the smooth mocha-flavored frosting. Inside, the thicker filling continues the mocha taste. 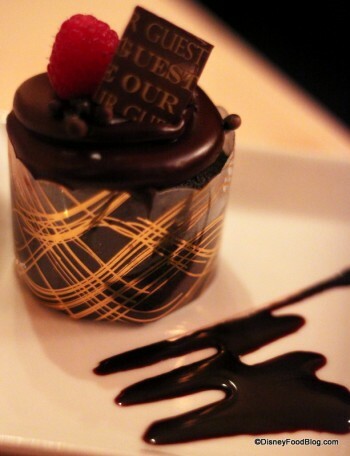 We love the dark chocolate molded “coffee beans” on top! 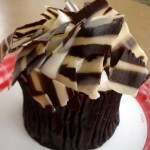 Zebra Cupcake: This delectable goodie features vanilla cake piled high with buttercream frosting and white- and dark-chocolate striped shavings. 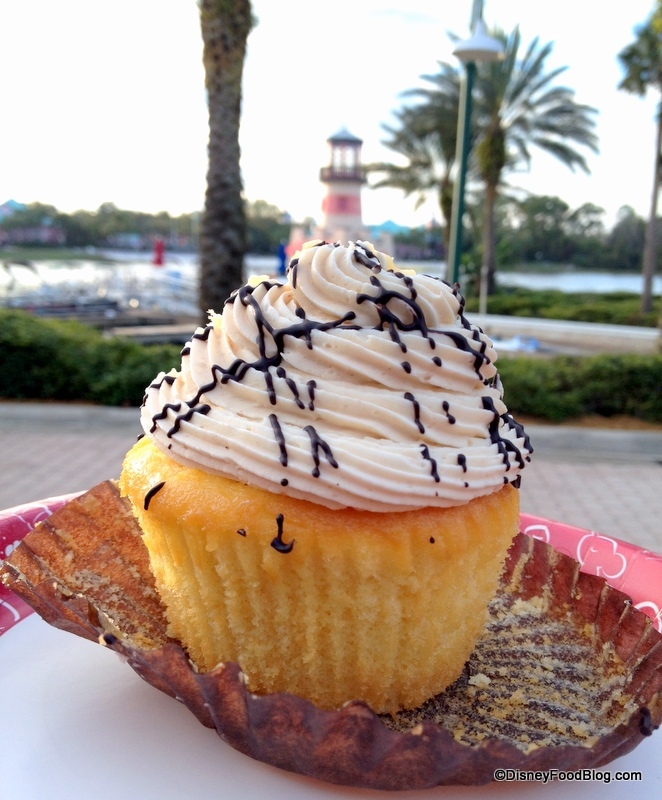 Representing the graceful zebra found on the Animal Kingdom savannas, it’s the perfect sweet treat for this theme park! 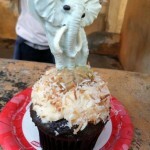 White Chocolate Elephant Cupcake: The tallest cupcake in our bunch of snacks, this begins with dark chocolate cake, a vanilla cream frosting, and toasted coconut. 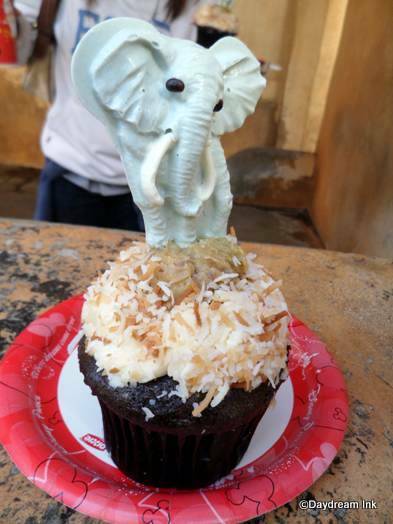 What makes it outstanding, though, is that gorgeous white chocolate elephant on the top! 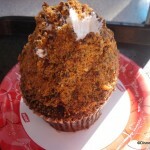 Peanut Butter Cupcake: Possibly the new fave cupcake at the Disney Food Blog! 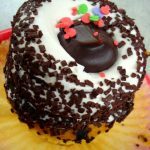 This cupcake is topped with a cookie-dough textured frosting that is also deliciously discovered on the inside of the chocolate cake. 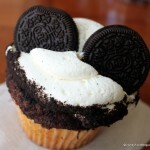 Oreo Bon Bon Cupcake: Vanilla fans will enjoy the yellow cake and frosting! 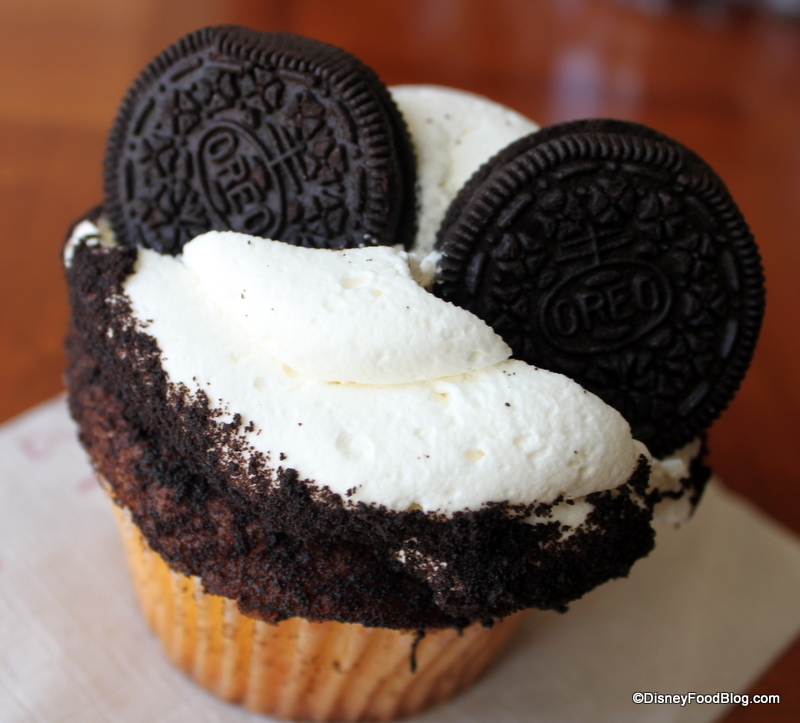 An Oreo crumb ribbon circles the bottom of the frosting layer but it’s the buttercream frosting (that tastes like cookies and cream) that creates a memorable cupcake. 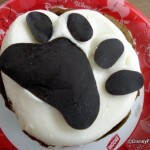 Oh, and it’s crowned with Mickey Oreo ears! The King Cupcake: As a tribute to Elvis Presley, the cupcake features all of the flavors from the King’s renowned favorite sandwich: Chocolate Cupcake, Banana Custard Filling, Peanut Butter Frosting, Chocolate Drizzle, and yes – Candied Bacon! 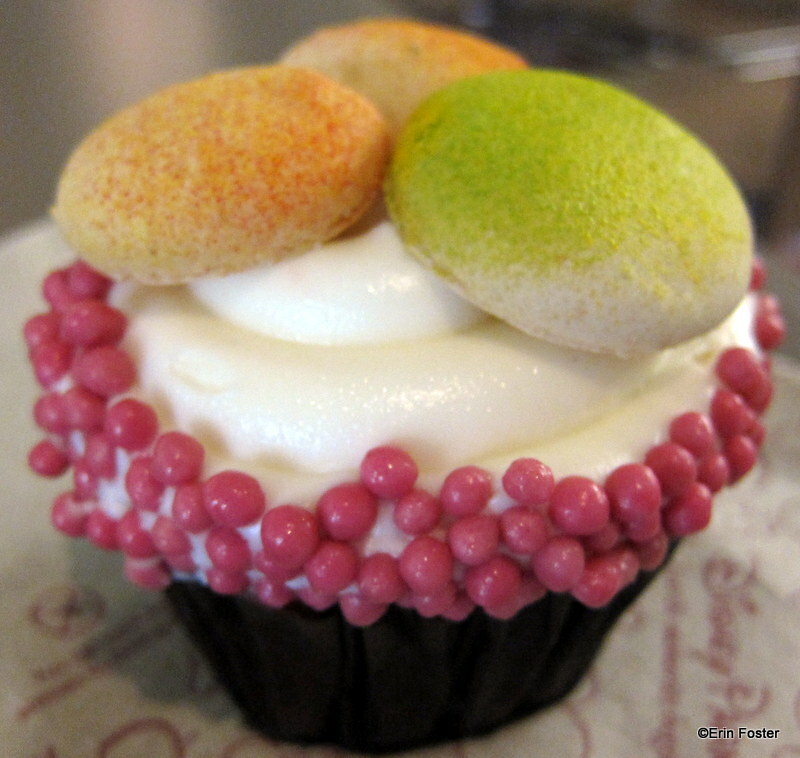 Macaroon Cupcake: Yellow cake is topped with vanilla frosting then crowned with crunchies and macaroon-like cookies. It’s a pretty presentation! Chocolate Raspberry Cupcake: An attractive cupcake with colorful Mickey sprinkles and dark chocolate curls, plus thick pink buttercream frosting. Dig into the chocolate cake, then try to figure out if the frosting is actually raspberry flavored or just a raspberry color! 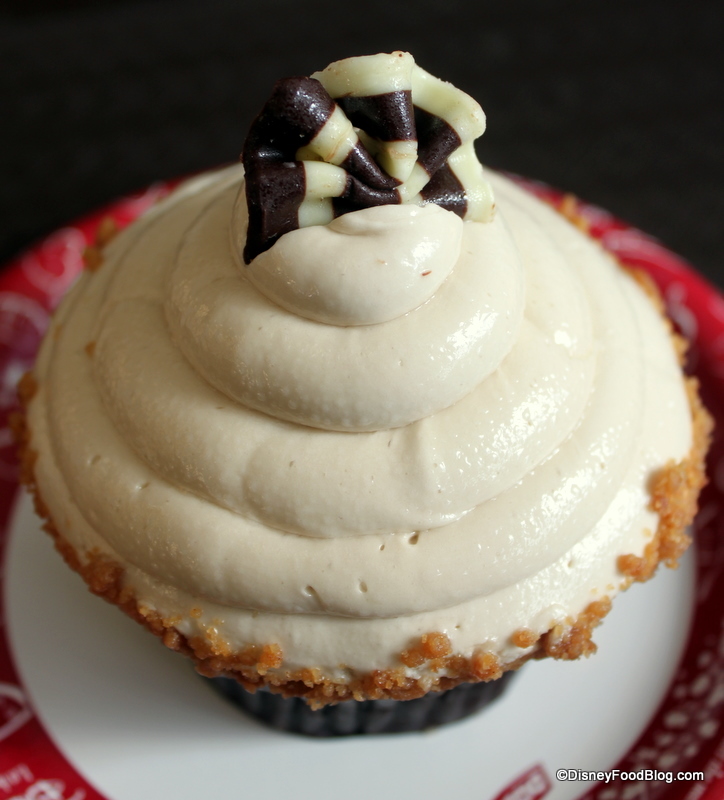 Peanut Butter Cupcake: The peanut buttery buttercream is thick and flavorful. 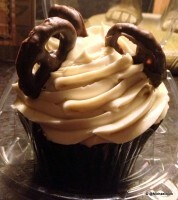 Drizzled on top of the frosting is melted peanut butter sauce and a thick fudge sauce with small peanut butter chips studding the frosting. 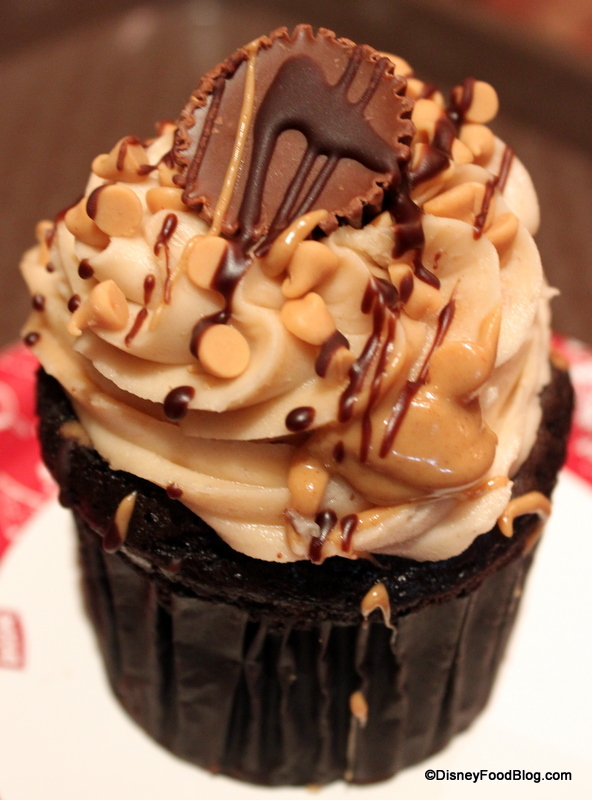 And it’s topped with a mini peanut butter cup. 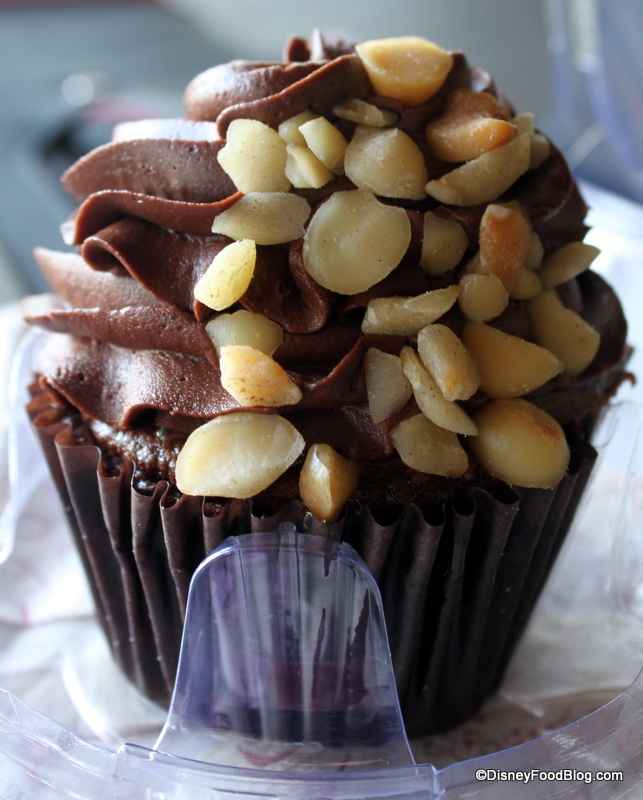 Once you dig into the dark chocolate cake, you’ll find even more peanut butter chips! 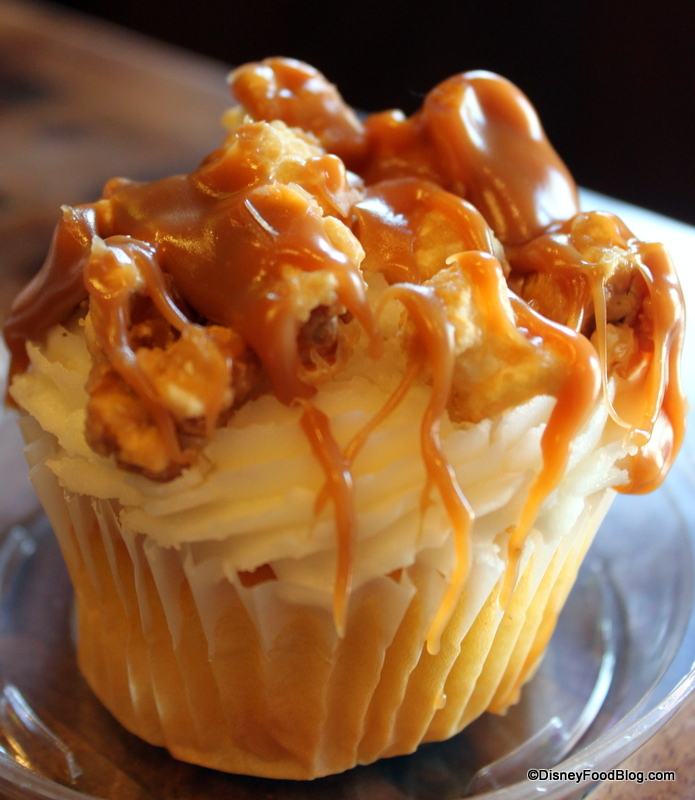 Caramel Corn Cupcake: A plain yellow vanilla cake with hearty vanilla buttercream frosting is drizzled with that gorgeous Werther’s caramel. The addition of the caramel corn on top adds a new texture! 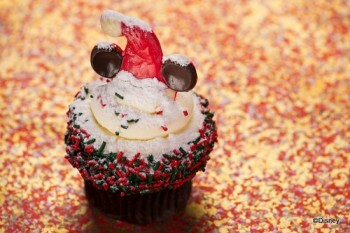 Red Velvet Cupcake: Red sugar crystals are incorporated into the vanilla frosting, and there’s a border of red sprinkles around the edge. 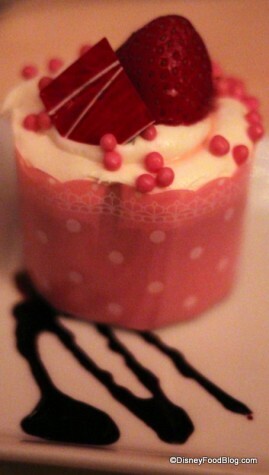 Inside the cupcake, there’s a delicious cheesecake center! 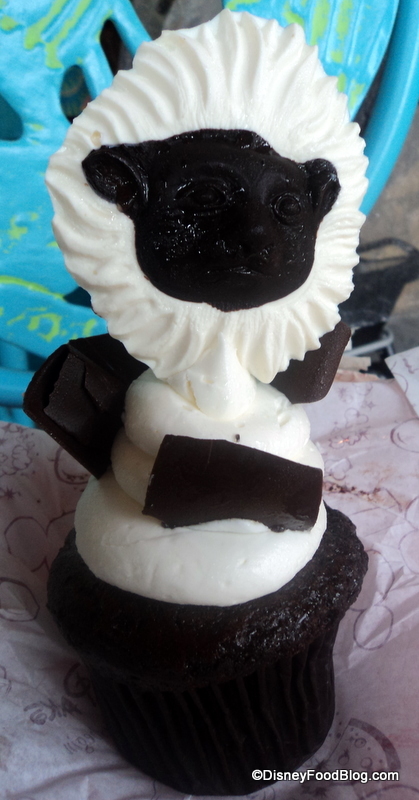 Cottontop Tamarin Cupcake: White and dark chocolate are blended to create the Cottontop Taramin face. 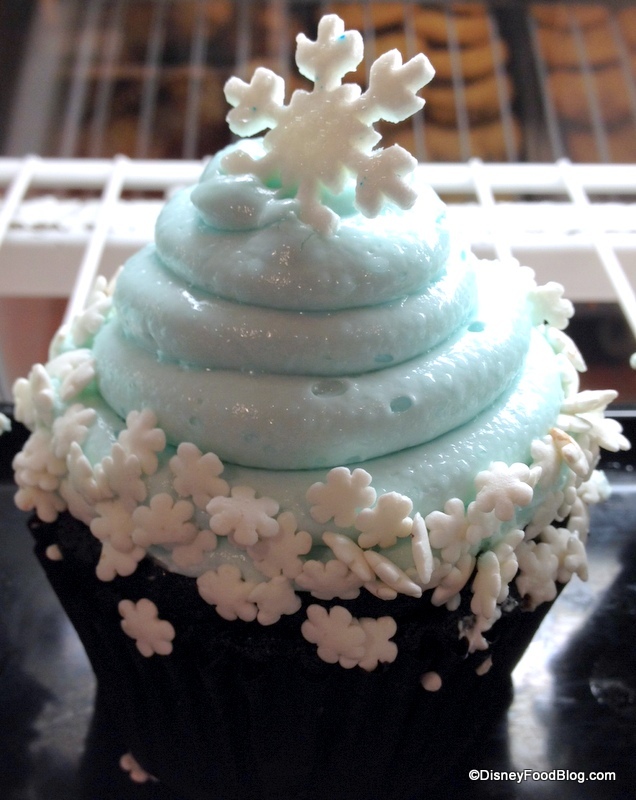 The mold sits atop a generous layer of butter cream. Underneath that is rich chocolate cake! Strawberry Shortcake Cupcake: A refreshing cupcake with light frosting and fresh strawberries inside the cake. The strawberries are drizzled with Grand Marnier! 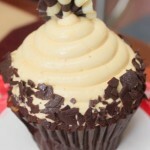 Dulce de Leche Cupcake: A vanilla cupcake piled high with sweet, creamy caramel frosting. 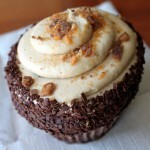 Inside the cupcake, there’s even more caramel-y goodness! 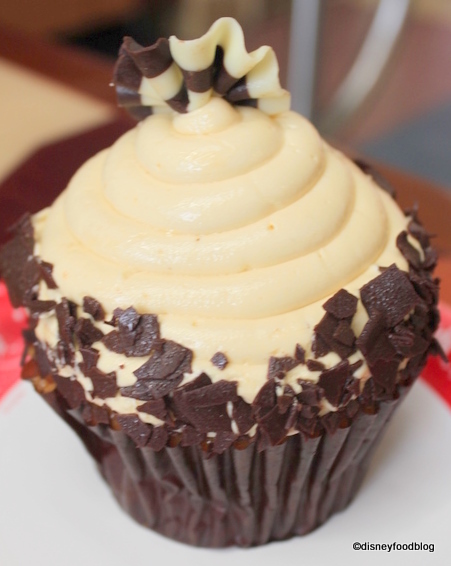 Chocolate Macadamia Nut Cupcake: Creamy frosting is luxuriously topped with macadamia nut slices atop this moist chocolate cupcake. Inside is a center of fudge-y ganache! 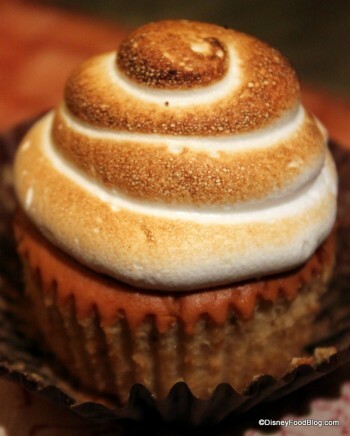 Lemon Ginger Cupcake: A perfectly golden brown cap of meringue tops the delicate ginger flavor in the cupcake. 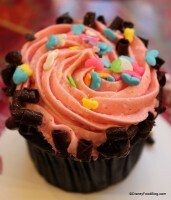 Super, tangy filling is the surprise inside! Smores Cupcake: A chocolate cake base is filled with chocolate chunk frosting,then topped with a vanilla-buttercream-marshmallow combo of frosting, and dusted with graham cracker crumbs. A few toasted marshmallows on top finish off this comforting snack. Spiced Apple Cupcake: A cinnamony-vanilla cake topped with what seemed to me like the same caramel frosting used on the Dulce de Leche Cupcake. The true flavor is inside where you’ll discover a mixture of apples, dried cranberries, and cinnamon. 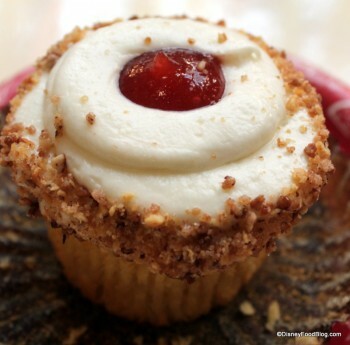 Guava Cream Cheese Cupcake: The moist, sweet vanilla cake has a tangy, guava jam-like center. 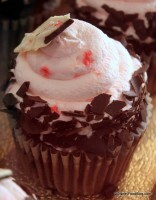 For a topping, savor the fluffy cream cheese frosting. Chocolate Cappuccino Cupcake: The chocolate cake is moist with coffee flavor frosting. 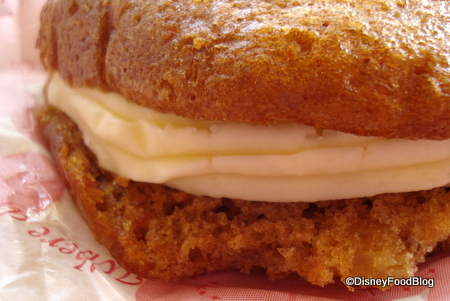 Those are toffee bits on the outside adding a nice buttery crunch. 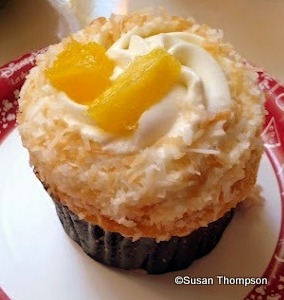 Pineapple Coconut Cupcake: Discovered at Sunshine Seasons (Summer 2012), it’s a refreshing treat similar to pineapple upside down cake. 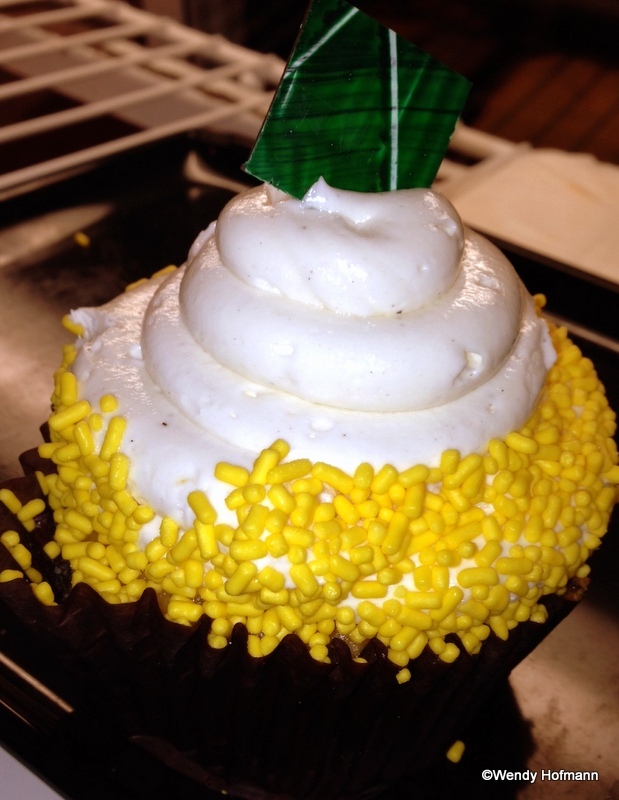 If you like pineapple and coconut, this one’s for you! 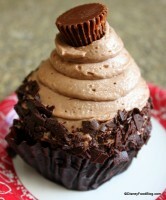 Chocolate Peanut Butter Cupcake: Creamy, light frosting sits atop a chocolate cupcake. Inside there’s a delicious peanut butter filling! Will you start with the crowning mini peanut butter cup or save it for the finale?! Pumpkin Mickey Cupcake: A totally adorable pumpkin cake topped with maple icing and garnished with sugared pecans. Christmas Cupcake: Decorated with traditional red and green sprinkles, this beautiful treat features gingerbread cake and cream cheese icing and is topped with a Mickey Santa hat! 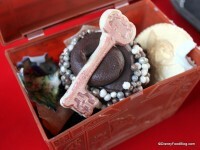 Captain Jack Sparrow Cupcake: This cupcake is wrapped in fudgey chocolate buttercream, and crowned with chocolate pearls! The cupcake is then tucked into a tiny treasure box with three more chocolates — a map, a key, and a coin! Festival of the Masters Cupcakes: Limited Edition cupcakes found at the Festival of the Masters in Downtown Disney! Decorate Your Own Cupcake Dessert: Fun for kids – this cupcake dessert is served at Animator’s Palate on the Disney cruise ships. 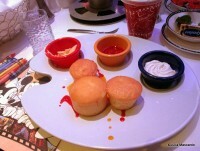 Strawberry Cream Cheese Cupcake: Served at the new Be Our Guest Restaurant, this is a sweet, delicious, and manageable cupcake. The cream cheese filling is more of a yogurt or custard consistency and not over-powering at all! 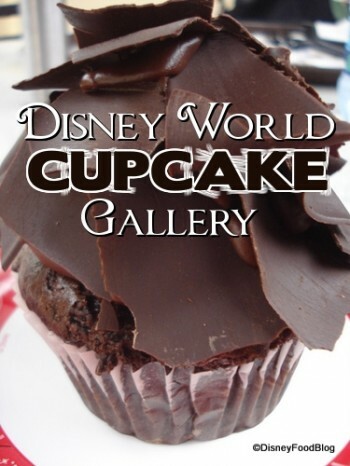 Chocolate Cupcake: Another Be Our Guest Restaurant cupcake, the Triple Chocolate Cupcake is made with chocolate sponge cake, chocolate mousse filling, and chocolate ganache. It was quite good, but very, very rich. Lemon Meringue Cupcake: This Lemon Meringue Cupcake at Be Our Guest Restaurant offers a taste of vanilla sponge cake, lemon custard filling, and flamed merinque icing. 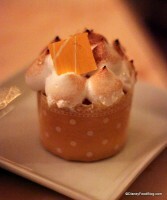 This one has some yummy (though a bit too sweet) lemon curd in the middle! American Adventure Gingerbread House Holiday Cupcakes: During the 2012 holiday season, the American Adventure Gingerbread House in Epcot served up four cupcakes – Apple Pie, Egg Nog, Red Velvet, and Gingerbread. These cupcakes were delicious! 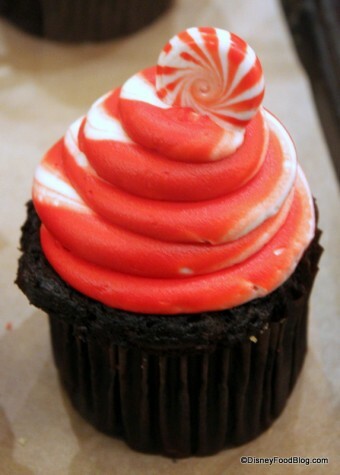 Peppermint Swirl Cupcake: Offered during the Magic Kingdom’s Mickey’s Very Merry Christmas Party in 2012, this Chocolate Cupcake with Vanilla Icing and Peppermint Candy was delightful. 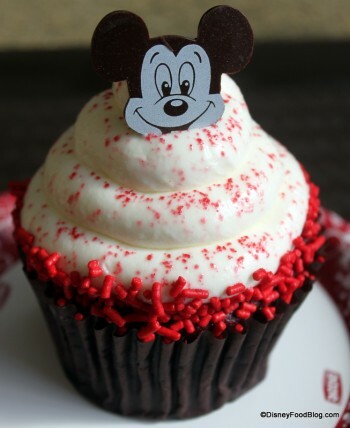 Boardwalk Inn Peppermint Cupcake: The 2012 cupcake had a new twist, with its peppermint bark garnish and chocolate shavings. 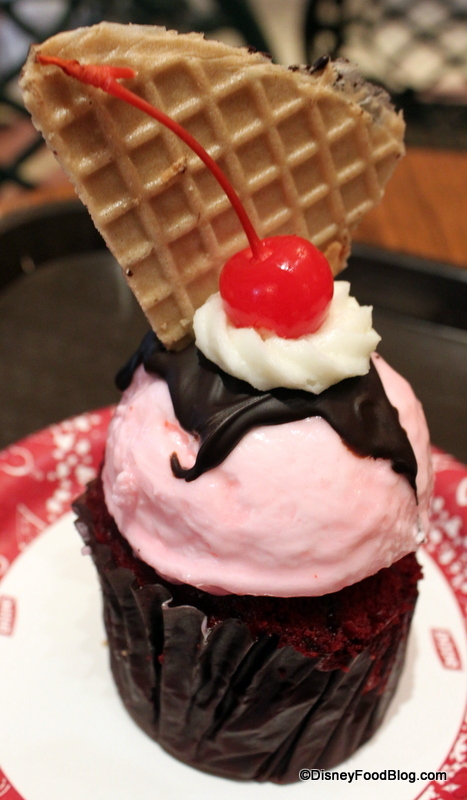 Cool Mint Cupcake: The Contemporary Resort’s Contempo Cafe created the Cool Mint Cupcake with icy mint frosting meets rich, dark chocolate cake for a cool and rich flavor sensation. 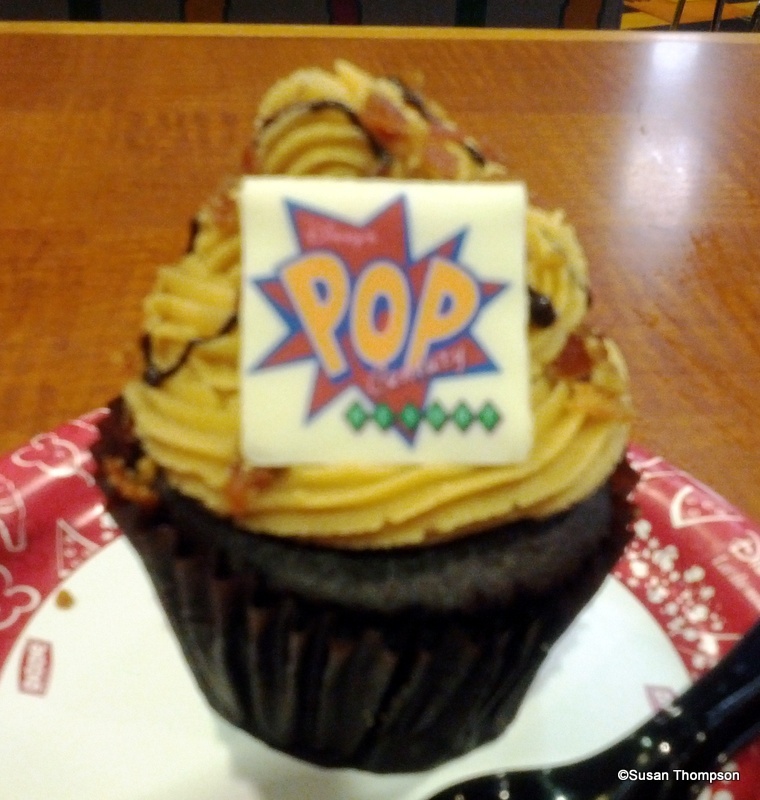 Chocolate Beer Cupcake: Captain Cook’s at the Polynesian Resort unveiled the Chocolate Beer Cupcake – it’s a malty but not too sweet concoction. 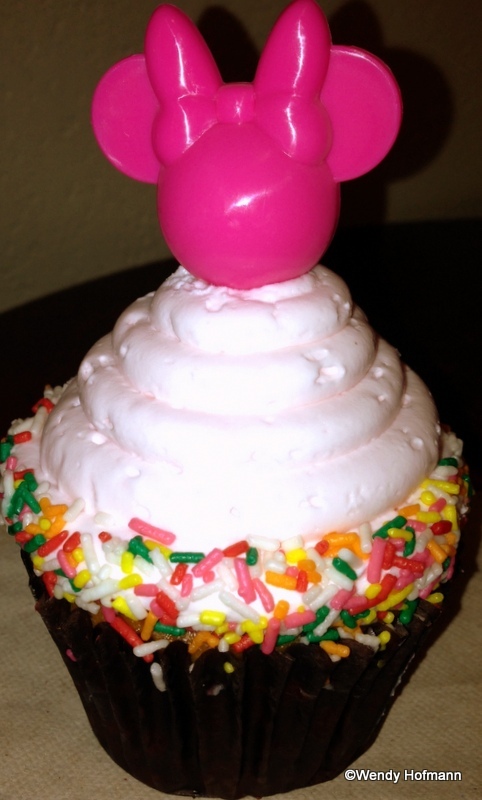 Birthday Cake Cupcake: It’s a vanilla cake with sprinkles baked in the batter, filled with buttercream, and then topped with pink frosting, rainbow sprinkles, and a pink Minnie Mouse cupcake pick. Also available in blue. Pineapple Rum Cream Cheese Cupcake: A white cake with pineapple flavored filling, topped with rum-flavored buttercream. Monkey Cupcake: A cupcake with peanut butter buttercream frosting and a filling with banana pieces! 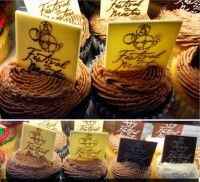 Choose from yellow or chocolate cake. We love choices! 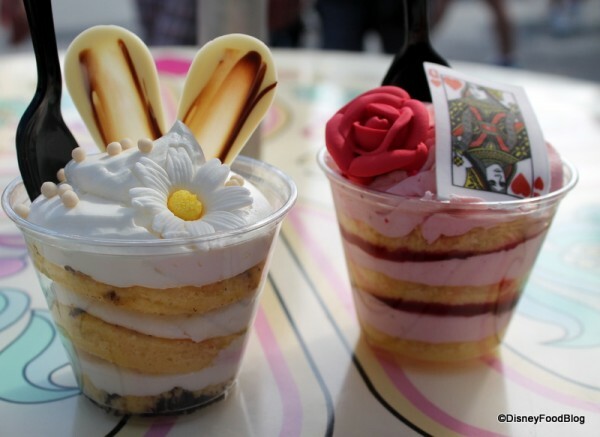 Gourmet Cake Cups: A Gourmet Cake Cup is like a cupcake in its ingredients (cake and frosting), but presented parfait-style. 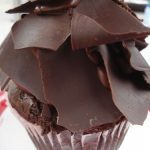 In addition to the frosting on top, there are multiple layers of frosting between the layers of cake, all served in a cup. 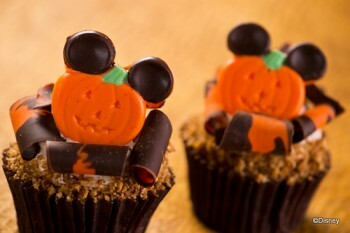 And yes, they are very, VERY sweet! 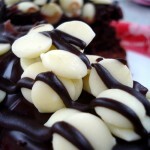 White Chocolate Chip Brownie: This time, we jumped from cupcakes to brownies with the extravagant, creamy goodness of this white chocolate chip version! A round brownie, covered in chocolate ganache frosting and dotted with white chocolate chips, this is probably one of the most over-the-top brownies you’ll try. 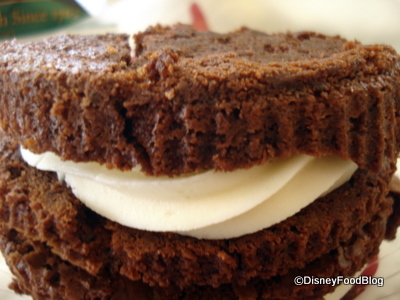 Brownie Frosting Sandwich: This lovely Earl of Sandwich treat has two of the most delicious brownies I’ve ever tasted, sandwiched together with creamy, fatty, sugary, delicious vanilla frosting (nothing whipped cream happening here). It is unbelievable — and quite inexpensive! 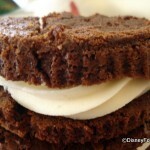 Carrot Cake Cookie: If there’s anyone out there who loves cream cheese frosting as much as I do, this cookie is for you! 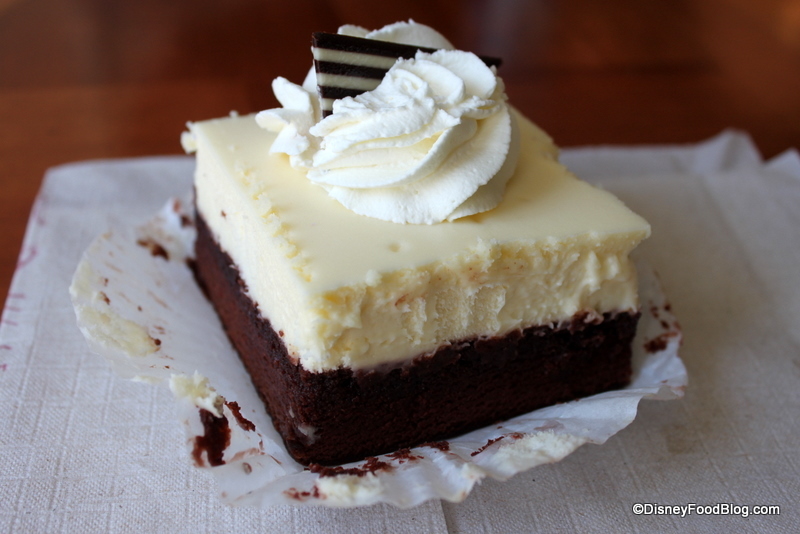 Cheesecake Brownie: The Boardwalk Bakery creates this decadent dessert which marries a tangy cheesecake with a strong, super-sweet dark chocolate brownie. 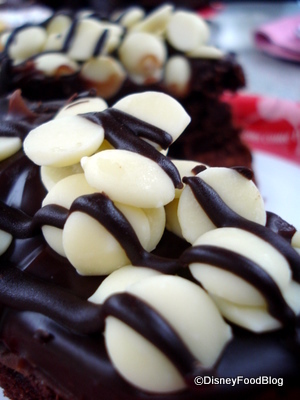 It’s large and rich – making a great treat to share! Peanut Butter Cake: Equal parts chocolate cake and thick, rich peanut butter filling! Dig in to the chocolate glaze which is more like a ganache than frosting. 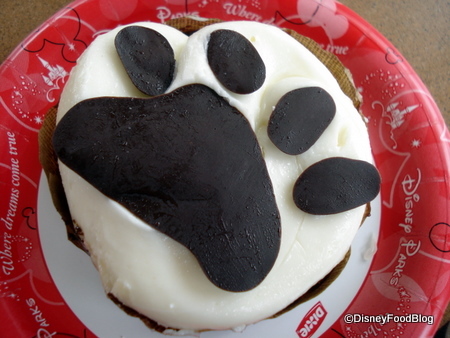 This dessert is delicious! 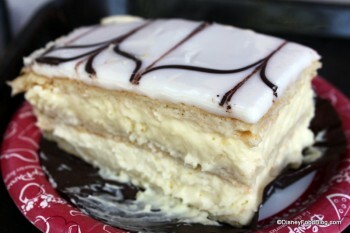 Napoleon: Topped with a thick glaze, this treat is decadent. Classic layers of flaky, buttery pastry are interspersed with thick, rich vanilla custard cream perfectly paired in every bite! 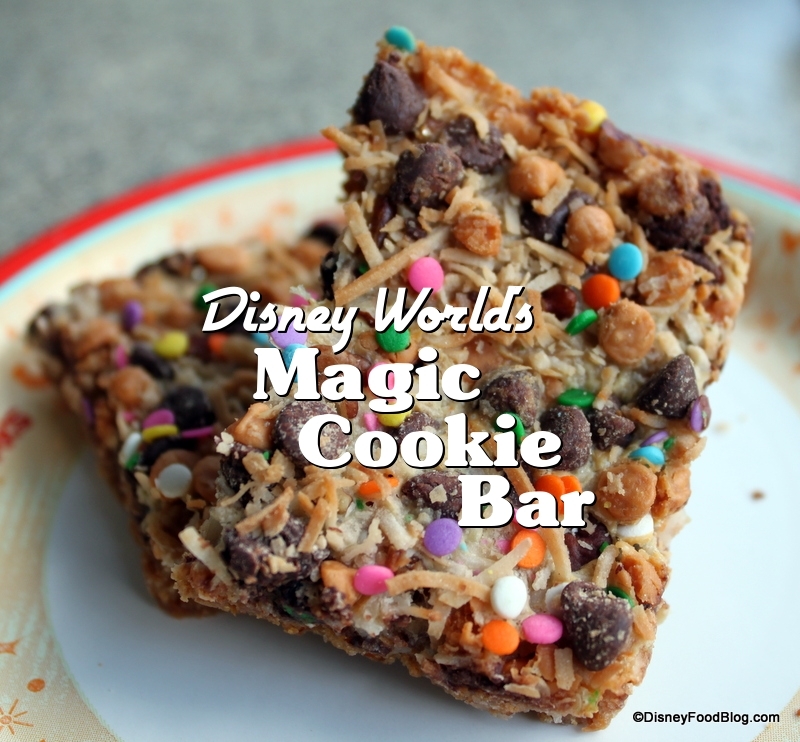 Magic Cookie Bar: There’s a ton of flavor going on here, with chocolate and butterscotch chips, condensed milk, coconuts, and nuts! Jumbo Turkey Leg: Smokey, salty, juicy, and meaty, this snack isn’t just a snack — it’s a meal!